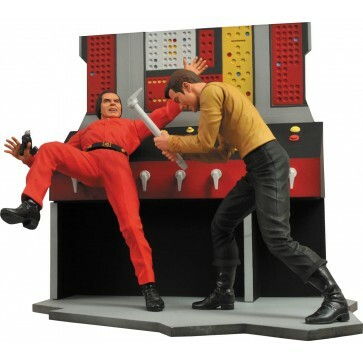 Art Asylum brings you an all-new Star Trek action figure line, designed exclusively for collectors! And who better to start the line than none other than Captain James T. Kirk, from the classic episode "Space Seed"! This 7-inch figure comes with a diorama-style accessory that you can use to display Kirk in battle with Khan Noonien Singh in the engine room of the USS Enterprise. Features interchangeable parts for a variety of display options and display-ready Select packaging.